Back in late September 2013, the GOP-controlled House of Representatives was throwing one of its episodic hissy fits about Obama­care. Shortly before the GOP shut down the government for over two weeks, one of its members laid out the Tea Party negotiating strategy for refusing to set a budget for the biggest economy in the world. “We have to get something out of this,” said Indiana Representative Marlin Stutzman. “And I don’t know what that even is.” Genius. Three and a half years later, Republicans have control of both houses of Congress and the White House and their strategy is no more sophisticated. Gifted with a president unhinged enough to sign off on whatever legislation they pass, it turns out that when it comes to figuring out the health-care policy they want, Republicans still “don’t know what that even is.” Despite voting more than 60 times to repeal Obamacare since it was introduced, the moment the Republicans actually get the chance, it turns out they can’t come up with a coherent plan for its replacement. So long as Brexit was unlikely, it had many parents; once it became a certainty, it became an orphan. In its reflexive oppositionalism, a significant and growing section of the Republican Party is like the dog that caught the car. Dogs like to chase cars. But they are not supposed to catch them. Indeed, catching them is always a disappointment. What use is a car to a dog? Dogs can’t drive. The British far right finds itself in a similar spot. But while the ineptitude of its American counterpart pulled the United States back from the brink (at least for now), the British far right is about to drive its country off the edge of a cliff. At the end of March, as promised, British Prime Minister Theresa May wrote to the European Union triggering Article 50, initiating the two-year timeline for Britain’s departure from the EU. Like the moment when Trump was sworn in at his inauguration, nobody knows how this will turn out, but few progressives think it will end well. And unlike the US presidential elections, which come around every four years, this is it for Britain and the EU. Within a week of Article 50 being triggered, Michael Howard, a former Tory leader, had threatened war with Spain over Gibraltar, a British overseas territory and limestone promontory of negligible strategic value; Douglas Carswell, the sole member of Parliament for the United Kingdom Independence Party (UKIP), which spearheaded calls for a referendum, left the party; and a tabloid columnist at The Sun, Britain’s best-selling newspaper, had branded the Spanish as “donkey rogerers.” The hard right in Britain has been fantasizing about this moment for decades. Now that it’s got what it wants, it has no idea what to do with the moment beyond making empty threats and issuing brazen insults. The politicians who led this charge have, predictably, fled the scene. Nigel Farage, the former UKIP leader, has resigned from politics for the third time. Assorted Tories, some of whom contested the leadership, have made themselves scarce. Of the principal architects of the Leave campaign, only Boris Johnson, the Eton-educated, mop-haired toff from central casting, remains as foreign secretary—and he is being sidelined by both the Tory establishment and his European counterparts. So long as Brexit was unlikely, it had many parents; once it became a certainty, it became an orphan. Britain has made a series of laughable threats and boasts that only expose how unprepared it is for the task ahead. It’s not difficult to see why. In two years, Britain has to extricate itself from an institution of which it has been part for more than 40 years, with which it shares a huge number of laws and obligations, while simultaneously saving face and not cutting itself off at the knees. It’s not obvious that it can achieve either. There is much to discuss. The bill must be settled, as Britain is called upon to stump up for the obligations it has made while it has been a member. This could be £10 billion or more. A recent poll showed two-thirds of Britons opposed paying it. There is also, more urgently, the human bill. Roughly 3 million people living in Britain are from other EU countries; roughly a million Brits live elsewhere in the EU. Some have been there decades and, having assumed that Britain’s membership in the EU was permanent, made no bid for new citizenship. This stuff is just the terms of the divorce, which is messy enough. Afterward (although Britain would like to negotiate it all simultaneously) will come the trade deal. The principal substantial opposition to EU membership was immigration. But in the absence of the free movement of people, the EU will not allow free trade. Meanwhile Scotland, which voted heavily to remain, has called for another independence referendum, which stands every chance of being successful this time around. The situation for Northern Ireland, which also voted heavily to remain and whose soft border with Ireland was underpinned by EU laws, is also complicated. Those who sought to put the Great back in Great Britain may soon find themselves exposed as the Little Englanders they always were. It will be left to May to align the politics of Brexit with the economics. Even if everyone were working in good faith, good humor, and a generous disposition, it’s unlikely all this could be figured out in two years. But they’re not. Britain has made a series of laughable threats and boasts that only expose how unprepared it is for the task ahead. 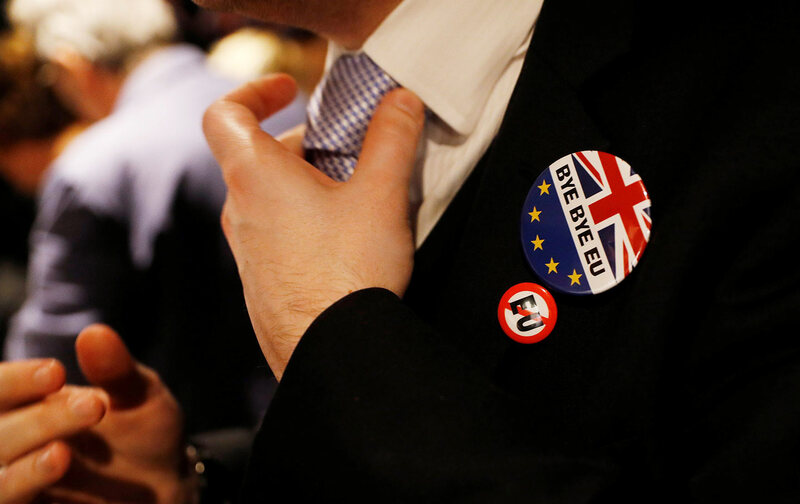 The EU owes Britain no favors. Its task is to defend the rights of those who are in it, not look out for those who are leaving. These discussions will take place while both France and Germany are holding national elections in which the far right is setting the agenda. Moreover, Britain has little to negotiate with. It’s leaving. The less belligerent tone it has adopted in recent times reflects that realization. May has said that when it comes to Brexit, no deal is better than a bad deal. As it stands, those might be the only two deals on offer.